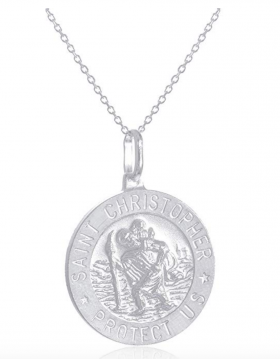 Our Fave Saint Christopher Necklaces to Gift! Beautiful things don’t always have to come in over-bearing packages. And this is why jewelry, no matter how small, has always been a thing of beauty. They can be used to beautify any part of the body wonderfully, complementing your outfit and making sure that you look your absolute best. For this article, we chose to look at necklaces and selected something that would work as a perfect gift no matter the holiday. 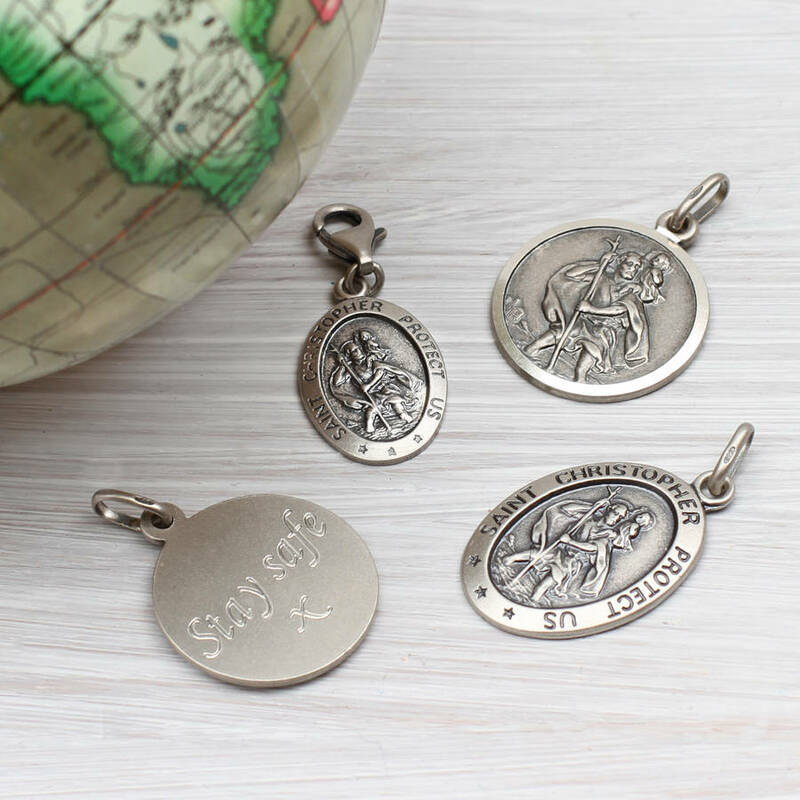 The Saint Christopher necklaces are among the top choices of people who love to collect religious relics, and we thought you’d like one too. Every piece we found was exquisite and carried so much positive energy that we didn’t want you to miss it. For holidays, birthdays or even anniversaries, they would fit perfectly into a gift wrap for gifting those close to you. 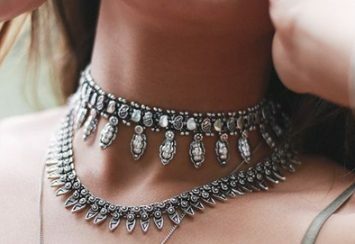 Read on and explore the meaning of the necklace, why you should choose one and ten amazing products that would charm you instantly. With so many opportunities to share a gift for the year, you want to be ready as they each draw close. But thinking of what to get can be very demanding and this is why we have several articles to help you select the best jewelry that would be perfect for her. 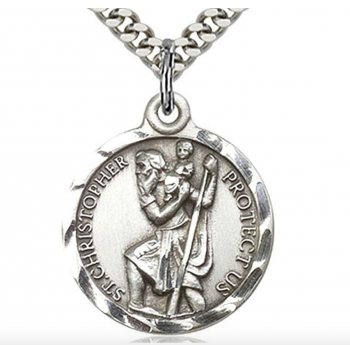 The Saint Christopher necklace is top of the list of several collections, especially when it comes to those that want something that reminds them of the faith. 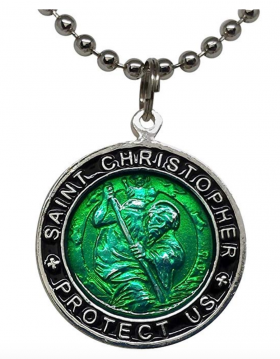 Saint Christopher is a Saint who lived in the 3rd century. The story of his existence has always been in doubt, but one thing that has stood the test of time in the story is how he rescued a child in the dangerous waves of a river. Believed to be Christ, the baby was carried by him across the mighty river. Eventually, he was martyred under the Roman emperor. Today, his image is used as a patron for travelers. From car keys, to necklaces and protection charms, the image is crafted in different shades of metal for aesthetic appeal. 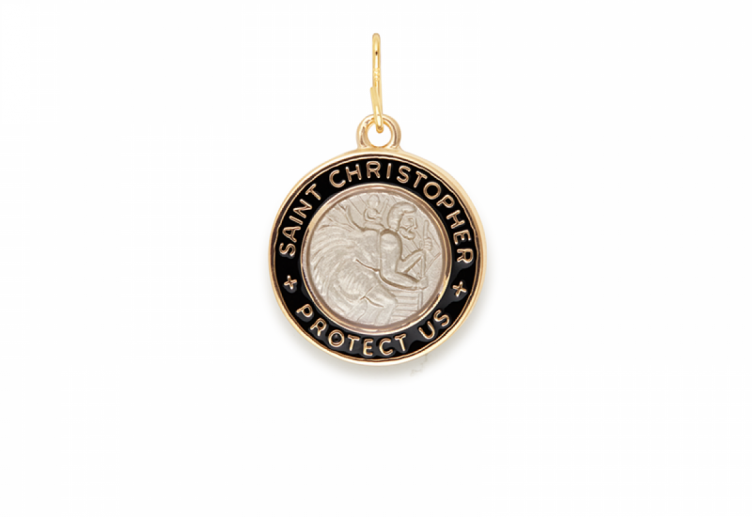 So far, the Saint Christopher piece has become a special gift for students, children, babies, and drivers. You can pick from so many options, but we have specific ones that stand out from the rest. We are confident that anyone that you gift it to would appreciate it and you can count on winning their heart with these remarkable pieces. 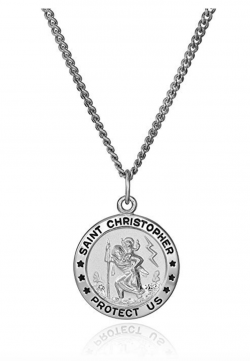 Saint Christopher’s necklaces always carry that signature of the Saint himself on the front of the pendant. There are usually made with bright colors that draw your attention to their simple yet elegant look. A first look at the necklace might not endear you to them immediately but check out the symbol it carries, and it becomes difficult to resist their aura. 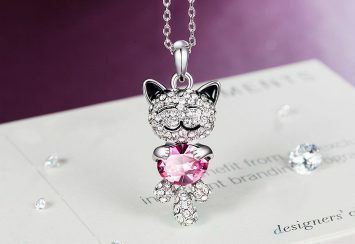 The brand crafted the exquisite piece with a guarantee that places them at the top of the line in the jewelry business. To make gifting easy, the necklace comes in a velvet gift box and a warranty that guarantees the wearer a lifetime of no fade or rust. You can get one at a price that won’t break your bank. Take one look at the image of the Saint, and you would love the good luck it brings you. Other info: you can get the product with no chain and use any chain you want to rock the unique pendant. Gifts always put you into the good books of people. It doesn’t even have to be a special occasion before you show how much you appreciate someone by giving them a gift. This piece comes with all the needed feature to create a special feeling in the heart of that one that would receive it. The product is not only made with quality materials, but there is also a level of dexterity added to carving it that makes the build nothing short of excellent. 925 sterling silver is the base metal used to craft this wonderful piece. The metal is hypoallergenic and safe for anyone, no matter your allergies. You will be comfortable with the fact that the pendant comes in three different sizes. So you can choose between small, medium and large pendants. 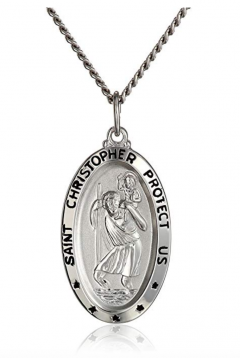 There is also the inscription along the circumference of the pendant that reads ‘Saint Christopher protects us,’ which is the main selling essence of the necklace. Finally, the clasp of the ring is made using the spring ring design, to enable it to stay firmly on your neck and reduce the chances of losing it. If you need something as a gift to make the celebration beautiful, then this should be your top choice. Other info: there is an 18-inch link chain with the pendant that is also made of 925 sterling silver. Uniquely designed to look astounding, this is a piece that combines religious symbol with a balanced sense of fashion. The necklace comes in colors that make it stand out clearly. You can see the picture of the Saint clearly and be sure of the protection it has for you. Wet Products may not be in your books yet, but they certainly would have a spot in your heart after you get this product. Crafted with black plated silver alloy, this necklace is one of the most elegant pieces of Saint Christopher necklace we could find. The edge of the necklace is coated black, while the part that houses the Saint’s picture is green — contrasting well enough to magnify the patron’s significance. You also get a 23-inch chain that is made with the same base metal and carries a ball chained style for better functionality. You can get the chain in a gift wrap so that gifting it is pretty easy. For Christmas, Hanukah, New Year, Thanksgiving and any other season, you can click the link and get one delivered to the one you love. Or wrap it up and slip it under the Christmas tree. Other info: the pendant measure 1 inch in diameter. A lot of people love gold, whether it is in the pure form or as plating. It always glints in the sun and catch the light right at the perfect spot and make sure that the eye-catching effect is not lost on an onlooker. This piece would be the first thing that anyone notices on you when you sport it. The quality is unrivaled, and the review says it all about the integrity of the piece. With a dimension of 7/8 inch, the pendant for this necklace is quite simple but stunning nevertheless. It is crafted using sterling silver and has its rim plated with a 14K gold stamp, while the inside has a silvery beauty that is nice to look at. There is a rhodium finish to make the materials inert and inactive when it comes in contact with the skin. The chain that is attached to the piece is 24 inch with a lobster claw clasp. Another thing that you will enjoy about the necklace is that you can remove the chain and wear the pendant with any chain length at any time. The item is a gift box when being delivered, so if you are planning a surprise party and need an impromptu gift, this is just what you need. There is also a money back guarantee which you definitely won’t need. 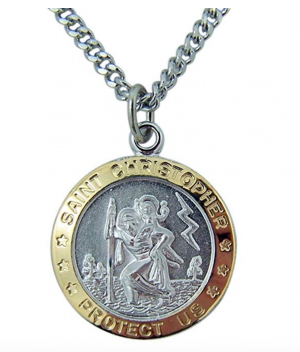 Other info: there are other Saint’s designs available in this collection, but Saint Christopher is our favorite. Amazon collections have some of the best products that you can find, and this is because they took the time to search through several collections and pick the best. This necklace from their very best has all that you need in a perfect gift. The lettering is easy to read, and they have taken the liberty of translating the famous inscription, usually found in Latin, to simple English. The first thing that is prominent in this option is the picture of Saint Patrick bearing the ‘water baby’ that is prominently drawn on the front. It captures the whole meaning of the symbol, and the detail was built using a rhodium plated stainless steel without tarnish or lead. The pendant was handcrafted to the most exceptional quality in the US and features a die-struck process for exceptional details. You can trust the piece to endure the test of time and last for a very long time. Sturdy, yet elegant, the dramatic look of the necklace is enchanting, and this is why we know it would make the best option when it comes to gifting. You don’t need to consult your financial analyst before purchasing this piece for any special season around the corner. Just order up and have it delivered in a gift box. Other info: the necklace features a spring ring clasp. The church reveres relics like this, and this particular piece brings that reverence to life. The chain has a necklace that boldly carries the patron of travelers carrying the baby as he crossed the big river. It is such a great idea for a gift for someone close to you going on a journey. The necklace is a sign that they would only have good luck and safety as they travel. The necklace is a combination of a pendant and a chain that was both made using the 925 sterling silver. There is no danger surrounding the use of it. So, whatever part touches your skin would only leave smooth caresses as you sway along with it. The pendant is 29 x 20 millimeter and held by a 24-inch chain. One thing that makes the necklace unique is the hollow spaces left between the outer ring and the carvings of the Saint. The medal is filled with polish and satin finishes to make sure that you get nothing but the best quality. You can get the necklace in a gorgeous gift bag and pass it on exactly as it was delivered. It will make a great impression on whoever receives it. Other info: the chain is made with curb style for more comfort. The Saint Christopher necklaces come in different shapes, sizes, and style. And each one is unique in its way with amazing features. This product from WJH has an oval shape and is made with high-quality materials. You can see the fantastic effort used to make sure that he crafting is impeccable. So get one for your colleague, friends, family or acquaintances. This product was crafted using stainless steel of high quality. Each material is strong, durable and still dazzling. With such a combination of amazing features, every other thing falls in place. So from the dimension to the 24-inch stainless steel endless chain, you can count on the intricate setting used for the necklace. Additionally, the high-quality pewter medal comes in a blue gift bag that makes it the perfect item to use as a gift. For your child first car or your driver’s birthday, this item would mean so much to them. You can also give it to those that are seafaring or constantly move from one place to another. The price is budget-friendly just for your satisfaction. This piece from Dear To Me, used stainless steel plated with gold from the chain to the pendant, to create such a beautiful ornament. The jewelry is made with die struck to make sure that it lasts for a lifetime and it can even be passed down generations with no blemish on it. With the golden dazzle that the necklace cast it is difficult not to notice it even among plenty of people. It is high in aesthetic appeal, and the quality of material used for crafting it cannot be overstated. 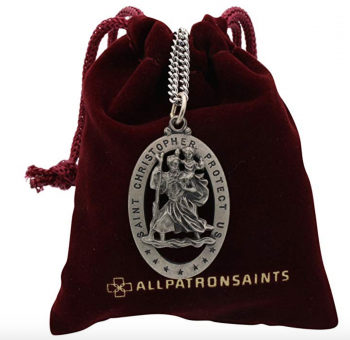 We chose the piece for the Saint Cristopher crafted into the middle to represent the famous traveler’s patron. It is a proper choice when it comes to gifting someone special something that would not quickly fade from their heart. Dimensionally, the pendant measures around 0.85 x 0.59 inches and has a chain that is 24 inches long and puts the whole weight at just 11.95 grams. To make it convenient for gifting, the necklace comes in a classic small box that can also work as storage. Other info: the pendant is oval shaped and is plated with 14K gold along with the chain. As we draw close to the last item in our collection, you could have found the one that you want to wrap up and send as a gift. But check this remaining product to make the best choice. Joy Jewelers are interested in making sure that you get nothing but the best when it comes to jewelry. They have a collection that is filled with high-quality jewelry that you can easily pick from. 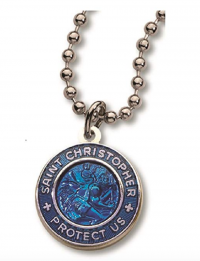 And from one of their best arrays, we picked this awesome Saint Christopher necklace that is as gorgeous as they come. Made with a silver plated alloy, the metal looks as shiny as possible. The base metal is hand enameled and measures ¾ inch in diameter. You can count on the 18-inch chain to secure the piece around your neck successfully. The chain is the bell type with links for each of them, and there is a tube clasp for convenience. The inscription ‘Saint Christopher protect us’ is made on the rim and coated black for better visibility. This is a great gift for graduation, military, drivers or any other person you wish to be protected as they go out every day. We know anyone that opens a gift wrap and finds this inside would be delighted, so get it today. Other info: the back of the necklace does not have anything design on it, it is blank and can be used for inscribing the name of the person you are gifting. This is the last item in our collection, but that does not mean that it’s our least favorite. The products are not listed with ranks. 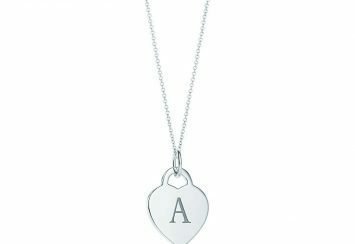 The rhodium plated necklace comes with easy to read lettering and great detailing such that you can see what the necklace stands for. There is no lead, cadmium or tarnish in the components, so you don’t have to worry about sending someone to the dermatologist. The base of the necklace is crafted with 925 sterling silver, and the pendant has a round shape to make it perfect for your neck. There is also a 20-inch steel curb chain in the package, and if you don’t like the length, you can always remove the pendant and use it with another chain. For quality assurance the piece was made with die-cast, to make it as durable as possible. There is that joy you feel when you see the necklace on the neck of the person you gave, and we want you to have just that. Extra care was taken with this piece to assure the highest level of quality possible, so anyone can wear the piece with pride. For any special season, send this in a gift wrap, and you will be well appreciated. Other info: the piece comes in a regal blue suede-cloth pouch. 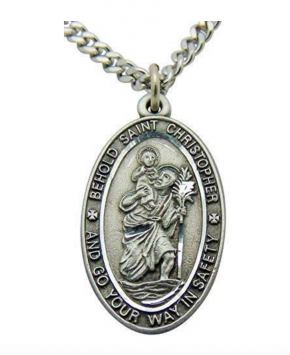 Which category of people should be gifted Saint Christopher necklace? In case you think Saint Christopher being a patron widely celebrated by Catholics is only meant for them. Well, you are undoubtedly wrong. The symbol stands for a Saint that protects and ward off any danger that is around while traveling. In his story, we mentioned how he rescued the sweet baby Jesus from the river and carried him across the dangerous waves. Well, that is exactly how he sees travelers off to their destination and back. You can give it to your child while she is going off to college, your driver who travels the road each day, family and friends that are going for a trip and even Christians that are close to you. 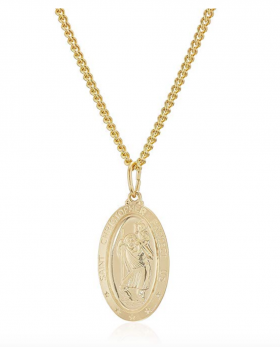 What is the best chain to go along with my Saint Christopher pendant? Gold and silver chain are great for any pendant, but you might want to check if the person you are gifting has any case of allergies. Also, 925 sterling silver would guarantee no allergic reaction for such an affordable price. ✓ Wrap it up in a soft cloth or piece of tissue when it is not in use. This would make sure it isn’t prone to tarnish. ✓ Make sure the clasp isn’t worn out, and you can add a safety chain in case the clasp is broken. ✓ You can use mild cleaning agents like soap and water or ask your jeweler for the safest way to make sure the jewelry stays clean.